Being a working parent isn’t easy: from balancing work and family to being great at both roles, it can be tough, but at The Receptionist, we try to make both parts easier. 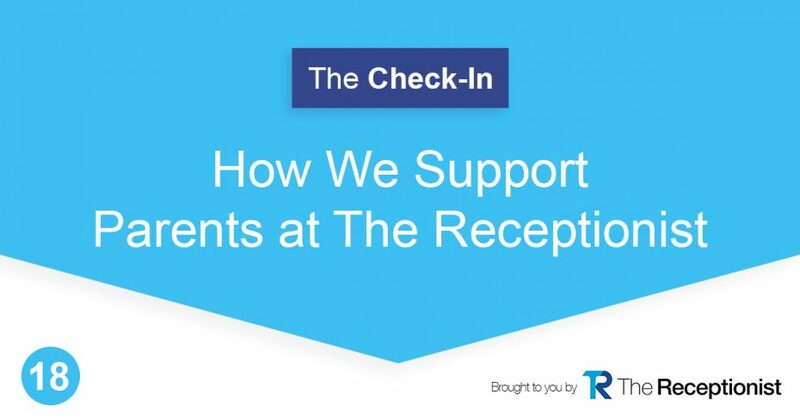 On this episode of The Check-In we’re joined by DeLynn Berry, Director of Engineering, Co-Founder, and dad of two to talk about being a parent and a team member at The Receptionist. When you’re a working parent, your life isn’t your own! So at The Receptionist, we try to make sure there’s not unnecessary stress on any of our employees, but especially the parents, when it comes to scheduling and time off. Though we don’t have formal policies in place about parental leave and time off (and we like it that way! ), we know it’s important to give parents the time and flexibility they need to handle being a parent. That way, they can step into work knowing that home-life and kids are taken care of. We know that great employees take time to find and when we’re talking with a prospective employee, we want them to know that we support our working parents. It’s important to us to not only allow flex time, but to really get to know the family members of our team, so activities that include families are important to us as well. We encourage any business, but especially start-ups, to understand that giving some flexibility to working parents actually works out well for everyone. On the episode we even chat about a 4-day work-week, but we’re not sure how Andy (our CEO) will feel about that! !